Astronomers have recognized various ways that stars can collapse to undergo a supernova. In one situation, an iron core collapses. The second involves a lower mass star with oxygen, neon, and magnesium in the core which suddenly captures electrons when the conditions are just right, removing them as a support mechanism and causing the star to collapse. While these two mechanisms make good physical sense, there has never been any observational support showing that both types occur. Until now that is. 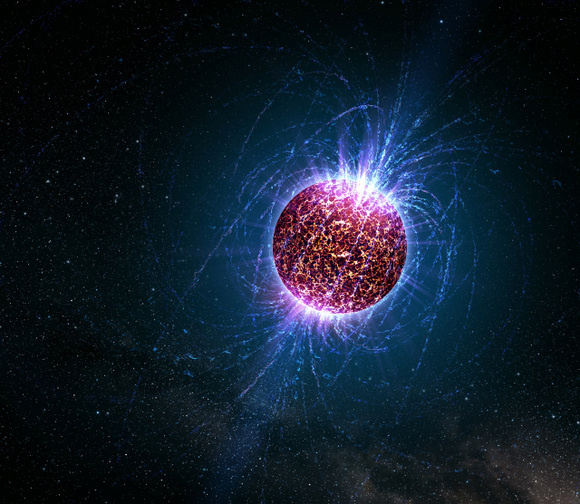 Astronomers led yb Christian Knigge and Malcolm Coe at the University of Southampton in the UK announced that they have detected two distinct sub populations in the neutron stars that result from these supernova. To make the discovery, the team studied a large number of a specific sub-class of neutron stars known as Be X-ray binaries (BeXs). These objects are a pair of stars formed by a hot B spectral class stars with hydrogen emission in their spectrum in a binary orbit with a neutron star. The neutron star orbits the more massive B star in an elliptical orbit, siphoning off material as it makes close approaches. As the accreted material strikes the neutron star’s surface it glows brightly in the X-rays, becoming, for a time, an X-ray pulsar allowing astronomers to measure the spin period of the neutron star. Such systems are common in the Small Magellanic Cloud which appears to have a burst of star forming activity about 60 million years ago, allowing for the massive B stars to be in the prime of their stellar lives. It is estimated that the Small Magellanic Cloud alone has as many BeXs as the entire Milky Way galaxy, despite being 100 times smaller. By studying these systems as well the Large Magellanic Cloud and Milky Way, the team found that there are two overlapping but distinct populations of BeX neutron stars. The first had a short period, averaging around 10 seconds. A second group had an average of around 5 minutes. The team surmises that the two populations are a result of the different supernova formation mechanisms. The two different formation mechanisms should also lead to another difference. The explosion is expected to give the star a “kick” that can change the orbital characteristics. The electron-captured supernovae are expected to give a kick velocity of less than 50 km/sec whereas the iron core collapse supernovae should be over 200 km/sec. This would mean the iron core collapse stars should have preferentially longer and more eccentric orbits. The team attempted to discern whether this too was supported by their evidence, but only a small fraction of the stars they examined had determined eccentricities. Although there was a small difference, it is too early to determine whether or not it was due to chance. According to Knigge, “These findings take us back to the most fundamental processes of stellar evolution and lead us to question how supernovae actually work. This opens up numerous new research areas, both on the observational and theoretical fronts. How or on what basis? (As much as I would appreciate a link to a paper at the Arxiv, I would prefer a non-technical explanation.) Thanks. They cover 3 possible explanations “of at least three ways”, but can eliminate the 2 others. One is two different neutron star spin states – but the populations correlate over orbital (as binaries) and spin period both instead of scatter over orbital period. Another is time dependency of orbital period – but it doesn’t change on the scale of these stars lifetime. The mechanism of electron capture probably needs some further discussion. In a dwarf star the electrons prevent collapse. This is because electrons are fermions which can’t exist in the same quantum state. The electrons “stack up” in a set of quantum states that are dense, which forms a Fermi surface, and this quantum statistics which prevents the electrons from being packed into the same quantum state also prevents gravitational pressure from collapsing the body further. However, there are atomic ions which can absorb these electrons if the pressure is large enough. The material in a dwarf star is a crystal lattice of atomic ions in a “sea” of these electrons. A cubic centimeter of this material has over a million kilograms of mass. If gravity supplies additional pressure electrons may be absorbed by protons in the ions which produces a neutron plus a neutrino. This occurs at the Chadresekhar limit and the process runs away. This produces the SNI type of supernova. This research suggests there are two processes which involve either electron capture with lighter elements (beryllium etc) or the implosion of an iron core. The timing of the collapse is different. At this point the physics is with what might be called nuclear chemistry that is somewhat beyond my domain of experience. It should be noted that the co-development of the pair of stars explains both the Be star, and the leaving of a semi-burnt out magnesium-core that subsequently explodes. It also allows for a wider massrange in the primary star than ‘just’ the 8-10Msun range, all depending on how efficient and thorough the masstransfer is. I would love to see some research on this, but up to 15 or even 20 Msun IMF doesnt seem unreasonable. There is most likely also a delay in the development of the SNe in that the core of the primary at the beginning is ultrahot and supported to a good extent by radiation pressure (=T^4) and gaspressure (less important, =T). As the core cools off, it keeps contracting into degeneratecy and eventually looses support by electron capture as explained in the article. Progenitor systems for research would be a Be-star surrounded by an ultrahot but smaller and less massive star (the prematurely ended core of the main star after the masstransfer). This phase might last a few 100 thousand years up to maybe a million years, until the originally main star expodes.